The James Miller Student Award is now open fur submissions. It was established by the Trustees of the Mabel Harper Charitable Trust to commemorate the work of the late James Miller, architect of many important buildings in Scotland, including many mercantile buildings in central Glasgow, transport buildings including Wemyss Bay Station and Gleneagles Hotel. The Award is designed to assist British students who are facing hardship issues which affect their ability to complete all or part of their course. Students will be able to use the money to purchase any support necessary such as books, equipment or to assist with field trips. The Trustees will also consider applications from students for assistance in the period following their year-out. This may include part funding of course fees for this period. Please click here for the submission form and the RIAS Student Membership application form (all applicants must be RIAS members). A key figure in the UK construction and home building industries with over 33 years’ experience, Gillespie has been responsible for the development and delivery of residential, commercial and infrastructure schemes both nationally and overseas. Gillespie takes the reins at a time when housing completion levels remain 36 per cent down on pre-recession levels and members tell HFS that it has never been harder to open new sites and get much needed new homes out of the ground. “Having worked in the construction and home building sectors my whole life, I am delighted to represent an industry which is absolutely vital to the social and economic wellbeing of the people of Scotland. 4 Oct – The multiple award-winning Hazelwood School, Glasgow by Alan Dunlop Architect was today included among an international list of “Inspiring Innovations in Education” 100 Global Inspiring Innovations of 2017 by HundrED. Green space and access to nature is beneficial for individuals, communities and society at large. There is also a growing recognition that access to nature can bring a range of health benefits. The research, which will be published in April 2018, will review existing practice and research opportunities for green infrastructure to the residents of social housing and the wider community. Sir David Chipperfield will present this year’s RSA event. Sir David is the first British architect to do so. Now in its fourth year, the annual Royal Scottish Academy Metzstein Architecture Discourse was founded in 2014 in memory of Isi Metzstein (1928 – 2012), partner of the Glasgow practice of Gillespie Kidd and Coia, Professor of Architecture at the University of Edinburgh and Treasurer of the RSA. More info on our architecture events page. GIA/RIAS members discussion : to gather thoughts/critique, stimulate debate and collate ideas on the RIAS 5 years vision strategy. More info on our events page. 28 Sep – Challenge fund announced for custom and self-built homes. Housing Minister Kevin Stewart will today announce £90,000 to support pilot projects to assist people wanting to build their own homes with a new Challenge Fund. “In 2015, for the first time since its inauguration in 2002, the RIAS Andrew Doolan Award for best building in Scotland was won by a housing project. Housing continues to be a key focus of architect’s endeavours. Today’s conference Housing – the future is being run by Scottish Government, Planning & Architecture Division (PAD), as a free event as part of the Royal Incorporation of Architects in Scotland (RIAS) Festival of Architecture 2017, and in conjunction with Architecture & Design Scotland (ADS). The programme has been designed to share approaches to housing delivery at a range of scales and to also profile a range of work happening at a strategic, city and rural level to diversify the delivery of homes across Scotland. 21 + 20 Sep – Combustible cladding has been found in 57 private high-rise properties in Glasgow, council officials have said, reports the BBC. Council planning official Raymond Barlow told MSPs that cladding had been found on some buildings in Glasgow, but said “it’s not public information yet”. Scottish ministers were informed about the concerns on 8 September, but flat owners in the buildings were not told. This Day Conference and Evening Cultural Celebration will look at issues associated with Patrick Geddes, ‘spirit-in-action’, ‘the place of spirit in his own work’. and ‘the nature’ of his ‘spirit-at-work’. Please see our architecture events page for more information. Walked tours of the building will take place on 23 and 24 September. This is a rare opportunity to visit Scotland’s most iconic modernist building in its raw and ruined state. More info on our events page. 13 Sep – Construction work starts on £37m Cumbernauld Academy and Cumbernauld Theatre Campus designed by Norr. A sod cutting ceremony was led by the Deputy First Minister and Cabinet Secretary for Education and Skills, John Swinney MSP. Homes for Scotland’s manifesto setting out the action it believes is required to return to pre-recession building levels of c25,000 per annum by the end of this Scottish Parliament can be accessed here. Homes for Scotland’s 6th Annual Conference will take a hard-hitting look at where the housing industry is now, where it goes next and how it gets there 10 years on from the Scottish Government’s Firm Foundations “discussion document”. This leading housing event takes place on 1 November. Short presentations from Architectural Practices on their 2016 GIA Award winning projects from the Education and Leisure/Art Categories. Cost: £20. More info on our events page. Day Conference and Evening Cultural Celebration – Speakers and Facilitators: Petra Biberbach, Lord Charles Bruce, Russell Clegg, Prof Bashabi Fraser, Dr Tom Kane, Roger Kelly, Prof Murdo Macdonald, Mike Small and Dr Ian Wight. 5 Sep 2017 – With the First Minister renewing her mission to tackle homelessness and rough sleeping in today’s Programme for Government announcement, the country’s home building industry emphasised the fundamental importance of ensuring that Scotland has a housing system that works for everyone. “With the number of new homes being built in Scotland flatlining, tackling our country’s housing crisis requires a broad approach that includes all market segments. The private sector has a huge role to play by not only helping to meet the aspiration of Scots to own their own home but also in relieving pressure on social housing. Key to the Scottish Government’s objectives will be its delivery of an effective planning system and the provision of the infrastructure that is needed to support development. We therefore cautiously welcome the announcement of a Scottish Investment Bank, however will need to see the detail on how it can facilitate this provision. Vast sums of money have been allocated with a view to upping the building rate and encouraging councils, housing associations and construction companies to deliver new accommodations despite a challenging economic environment. While such ambitions are laudable, there are many factors which can throw plans off target, and it is becoming clear that considerable increases in the price of building materials are heading up the worry list. A newspaper investigation earlier in the year disclosed that some of the essential raw materials of the construction industry in the UK have been hit by price increases of up to 35%. Hikes of this magnitude can push the most meticulous margin planning into disarray. The costs of some construction components, including plasterboard, chipboard and loft insulation, are rising at their fastest rate for 25 years. The Construction Trade Survey from the Construction Products Association in Q4 last year showed that overall costs increased for 88% of civil engineering contractors, while 75% of main contractors also reported a rise in raw materials costs. The main blame for these cost rises has been laid at the door of Brexit, with the subsequent decline in the value of sterling which is producing industry-wide inflation. Increased energy prices are also hitting manufacture of items such as bricks. Nearly a quarter of building materials supplied in the UK are imported and a modicum of good news is that, in a typically proactive response, many trade suppliers are actively seeking to source alternatives to traditional markets. But as well as cost issues, the construction sector is beset by an ongoing skills shortage affecting key on-site trades, with main contractors reporting at the beginning of the year that shortages of carpenters and plasterers were at their highest in nine years. The Federation of Master Builders also warned of a shortage of labourers. Nearly one in eight comes from outside the UK and there is concern that many of these employees may decide to repatriate in the event of a hard Brexit. As well as material costs, wage inflation is playing its part in the worries affecting construction. A survey by recruiter Hays showed that average salaries in construction and property rose by 2.8%, with building services achieving 3.5%. Nearly two-thirds of building service employers said they had raised salaries over the course of 2016 and the same proportion expect to have to offer similar rises in 2017, with 16% anticipating that these increases will be in the order of 5% or more. It is hardly surprising that the Office for National Statistics recorded a 1.2% decrease in construction output on May this year, both month on month and three month on three month. The most notable decline was in infrastructure, which fell 4%. The construction industry is resilient. It has to be, considering the wide variety of external factors which can buffet it unexpectedly. But despite all its efforts, a weaker outlook for the rest of 2017 seems inevitable. Andrew McFarlane is a consultant in the Glasgow North office of DM Hall Chartered Surveyors and a Fellow of Royal Institution of Chartered Surveyors. As part of the Festival of Architecture 2017 this free exhibition showcases 34 post-war Scottish Modernist buildings, from St Peter’s Seminary to the Forth Road Bridge, and has been compiled by final year students at the Scott Sutherland School of Architecture in Aberdeen. This collection of beautiful models and informative display panels, showcases an ambitious era of design, that propelled a generation of Architects careers. 1 Sep – Creative teams are invited to submit proposals for a project to celebrate architecture, Scotland’s Year of Young People 2018, with the potential to show the project at one of the most prestigious architecture events in the world – the Biennale Architettura, Venice, report the RIAS. The Scotland + Venice partners (A&DS, Scottish Government, British Council Scotland, Young Scot and Creative Scotland) are looking for a team to deliver an imaginative proposal to respond to the theme ‘Freespace’, the theme of the 16th International Architecture Exhibition, Venice in 2018. The team will ideally be connected to architecture as a creative discipline. How to apply: The deadline for submissions is noon on Monday 11 September 2017. To be able to access the tender documents you need to register (for free) with the Public Contracts Scotland website. 31 Aug – On Friday 1st September at 11.00 am the national Doors Open Days 2017 programme will be launched at the Botanic Cottage, Royal Botanic Garden Edinburgh. Places are limited, advance booking essential – see our events page for more details. 28 Aug – Breakfast event that challenges the use of daylight to transform homes and schools into sustainable and healthy indoor learning environments. 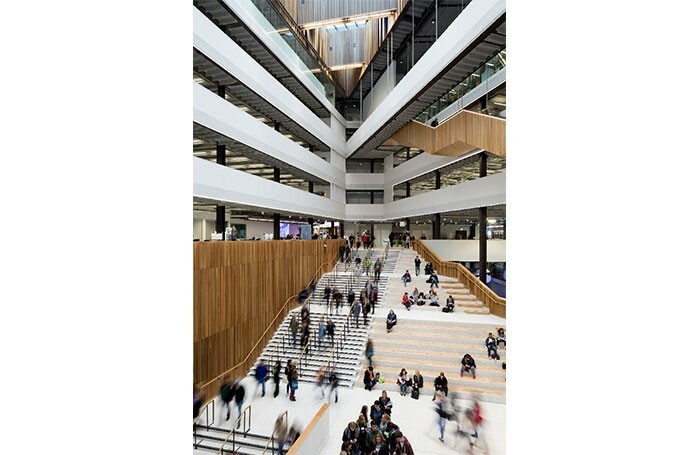 Hosted by roof window manufacturers VELUX®, there will be a discussion of the findings from research by The University of Salford that natural light and fresh air can speed up learning. The free event is at The Lighthouse, 11 Mitchell Lane, Glasgow on Wednesday 30 August from 8am to 10am – more info on our events page. A new Ayr Academy secondary school, built by Keir Construction and delivered by construction and infrastructure-focused partnership hub South West on behalf of South Ayrshire Council, is set to open when the school summer holidays end later this month. Ayr Academy, whose origins can be traced back to 1233 but did not come to be known by its present name until 1796, has moved to the Craigie Estate from its former location in the town’s Fort Street. The new Ayr Campus will cater for 1,000 school students, with the capacity for a further 300, and will create a modern and inclusive facility where students can learn in a sustainable and well-designed environment. The £25M project is a part of a £94m pipeline being delivered by the authority across South Ayrshire in the next 18 months with the aim of enhancing standards through targeted investment. During its construction the new Ayr Academy was used as a part of hub South West’s bespoke programme, ‘Your Future starts in Construction’, during which it collaborated with the Prince’s Trust and Ayrshire College to enable local youngsters to gain work experience on a live site and achieve a unique accreditation. Ayr Academy was the first project in Scotland to reach financial close post European System of Accounts (ESA 10) resolution in January 2016. Michael McBrearty, Chief Executive of hub South West, said: “Ayr Academy Campus is a wonderful state-of-the-art facility that I’m sure all students and teachers will enjoy. Brian McQuade, Managing Director of Kier Construction’s Scotland and North-East England business said; “We are pleased to have delivered this leading, modern Academy with fantastic new sports facilities for students and the wider community to enjoy, building on our track record of delivering quality schools throughout Scotland. 5 Aug – East Dunbartonshire Council is inviting the public to visit the Kirkintilloch Town Hall as renovation works near completion. The B-listed property is being transformed at the hands of Michael Laird Architects to form an art, cultural and community centre by September, stabilizing and renovating the original 1906 structure with the addition of a new build extension. 5 Aug – Data gathered from the Energy Performance Certificates of buildings in England and Wales has busted the myth perpetuated by critics of modern new homes that they are “rabbit hutches”. In fact, statistical analysis shows the mean floor area of new homes as being 94 square metres compared to 91 square metres for all domestic properties. This illustrates that, as well as new homes actually being larger than the total mean figure, they are also nearly 25 per cent bigger than the commonly referred to figure of 76 square metres which itself dates back to 1996 – over 20 years ago. “These official figures only apply to properties south of the border as the same information is not publicly available in Scotland as of yet, but they will hopefully help recalibrate the conversation on new homes and help bust some of the myths that surround them. “Of particular importance, the statistics also highlight the energy efficiency of new homes, demonstrating the significant savings of more than 50 per cent that could be achieved in terms of both estimated energy usage and costs. 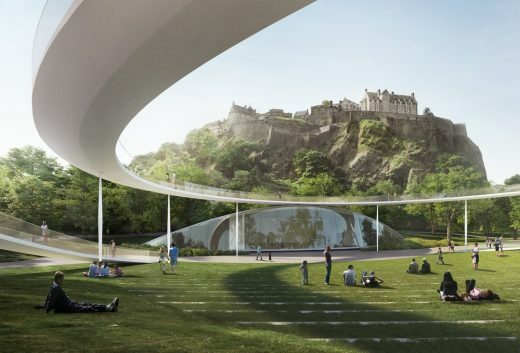 2 Aug – wHY, a Los Angeles architecture studio beat 125 teams from 22 countries to design the £25m project to revitalise West Princes Street Gardens. 2 Aug – A multi-million pound development at the A-listed Park Quadrant in Glasgow’s west end has attracted worldwide interest after flats were offered for sale in the missing part of the street. The Charles Wilson designed Victorian development, overlooking Kelvingrove Park, has generated more than 600 buyer inquiries since it was put on the market, including from the US and Hong Kong. Considered one of the finest examples of town planning in Europe this West End development was never finished after the Victorian developers ran out of money. 2 Aug – Urban Union, a partnership between Mctaggart Construction and Robertson Group, has announced its acquisition of 5.74 acres of land off Shawbridge Street to take forward the latest phase of regeneration in Pollokshaws, Glasgow. Barton Willmore have been commissioned to design 137 mixed tenure homes in the form of terraces and apartments with construction scheduled to begin next summer for completion by 2021. 2 Aug – An upgrade of Glasgow’s Queen Street Station is set to get fully underway this Sunday with the erection of temporary entrances, walking routes and road layouts to facilitate the build. This will see the relocation of a ticket office to Dundas Street and closure of the George Square entrance as perimeter hoardings are erected to allow an office block standing in the way of redevelopment to be safely cleared. 2 Aug – Midlothian Council has appointed Austin-Smith:Lord, in partnership with consultants Douglas Wheeler Associates, to lead renewal efforts for the town of Penicuik: more info + photos on the Edinburgh architecture news page. 2 Aug – A multi-million pound development at the A-listed Park Quadrant has attracted worldwide interest after flats were offered for sale in the missing part of the street. Considered one of the finest examples of town planning in Europe the West End development was never finished after the Victorian developers ran out of money. 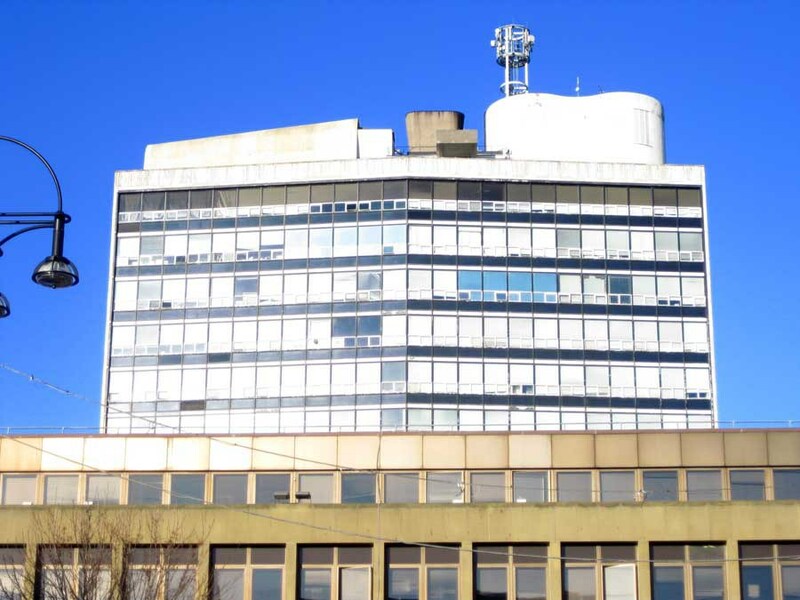 26 Jul – Plans for the Metropolitan Tower, known to generations as the College of Building and Printing and which can been seen from all of the city, will be on public display on Saturday 29 July. The exhibition will be open between 10.30am and 4pm that day in the foyer of the Metropolitan Tower. Also on display at that exhibition will be the plans for the sister building on Cathedral Street – the Charles Oakley Building. 18 Jul – The inaugural RIAS/Saint-Gobain Emerging Architect Award went to TAP Architecture, recognising two innovative Scottish buildings: the Aerial Adventures, East Kilbride, and the Scottish National Waterski Centre, Dunfermline. 12 Jul – A new £34.5m Cumbernauld Community Campus Building by Norr architects combines a purpose-built high school with a new theatre and arts venue. 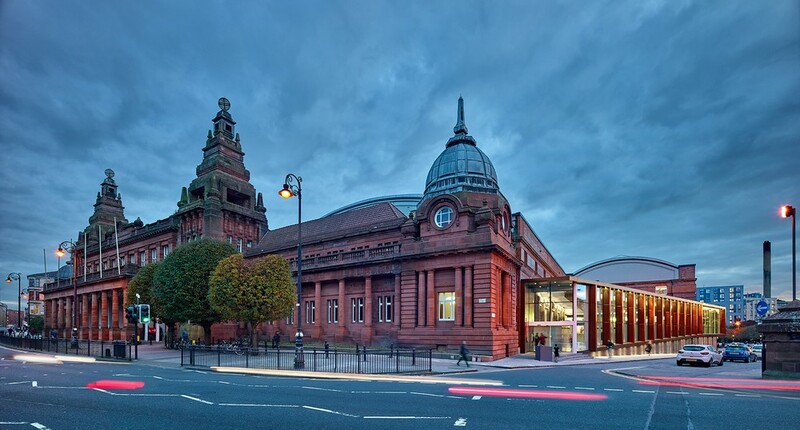 8 Jul – Following a large-scale redevelopment one of the Scotland’s best-loved historic cultural spaces Kelvin Hall is enjoying world-class success for its innovative combination of culture, education and sports in the same multi-use venue. 8 Jul – The Big Idea in Irvine had big aspirations – and cost millions of pounds of public money to build, reports BBC Scotland. It closed in 2003 after only three years of operation. Abandoned Scotland went to find out how it looks now. The event will take place on 13th July at Cafe Camino in Edinburgh, with presentations from this years nominated students. 4 Jul – Initiated by a group of architects, designers, photographers, engineers, visual artists, curators and musicians the Architecture Fringe is an independent, contributor-led series of events and projects across the arts which explores architecture and how it makes a difference to our lives. 4 Jul – Expresso Property Park Quadrant Ltd, developers behind the ‘missing piece’ of Glasgow’s Park Circus district have published a pair of illustrative video fly-throughs showing a bird’s eye perspective of 98 planned apartments and penthouses. 2 Jul – The number of households that have purchased a new home through the Scottish Government’s Help to Buy shared equity scheme has topped ten thousand, according to latest figures. The scheme, which means buyers can purchase a new home with only a five per cent deposit, saw a total of 2,370 sales during 2016/17. This takes the overall number of transactions since the introduction of Help to Buy (Scotland) in 2013 over the ten thousand mark – supporting thousands of jobs and contributing £1bn in Gross Value Added to the economy. 2 Jul – UK Tower ACM Cladding Tests – news of aluminium cladding samples from high rises in 41 England & Wales local authority areas failed fire safety tests. 2 Jul – Barony Homes propose to convert the B-listed former Golfhill Primary, Dennistoun, to flatted residential accommodation, plus associated new build on a playing field. The project is designed by Jewitt & Wilkie Architects. Only the façade of the school will be retained after full retention of the structure was deemed uneconomic. An adjoining janitors house and perimeter railings will be fully restored alongside new build flats fronting Fir Park Street. 28 Jun – The Scottish Government has launched a tower block safety review in the wake of the Grenfell Tower blaze in London as part of a wider review of building standards in the wake of the tragedy. UK Tower Block Safety Review News. 18 + 22 Jun – £12.3m centre for printmaking and the creative industry in Edinburgh designed by Page\Park to commence. Housed within a C-listed disused industrial building the project involes formation of new galleries, a studio, printmaking workshop and a café, in the Fountainbridge district. 22 + 21 Jun – The Chartered Institute of Building (CIOB), in light of the report into the defects that led to the closure of 17 schools in Edinburgh earlier this year and subsequent events, announced the formation of a Commission of Past Presidents to investigate the issue of build quality in the construction industry, and what needs to be done to address it. 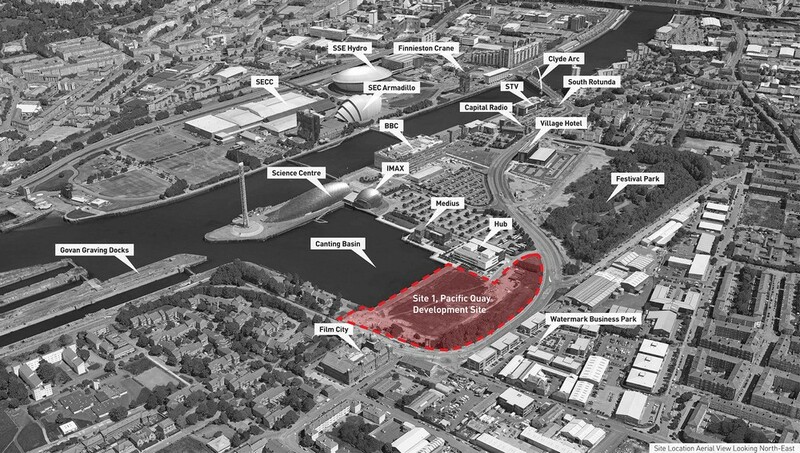 Drum Property Group is unveiling a new vision for one of Glasgow’s most high profile waterfront sites at a public exhibition on Thursday (June 22). 21 Jun – The launch of Historic Environment Scotland’s £11 million Engine Shed in Stirling is imminent: the building will be officially opened by Cabinet Secretary for Culture, Tourism and External Affairs Fiona Hyslop on Monday 26 June. The Engine Shed is Scotland’s pioneering new building conservation centre – the first facility of its kind in the world to combine research, education and public access – which will serve as a national conservation hub, using world-leading innovation to bring Scotland’s built heritage to life through technology and hands-on activities. Open to the public from Monday 3 July, the learning and visitor resource centre aims to spark the public’s passion and interest with Scotland’s historic environment and inspire a new generation to care more for Scotland’s diverse built heritage. 19 Jun – 68 homes for social rent at Olympia Street, Bridgeton, to be an ‘exemplar model of inclusive and affordable inner city living’. Elder and Cannon Architects have been engaged by Link Group to assume the role of lead consultant. 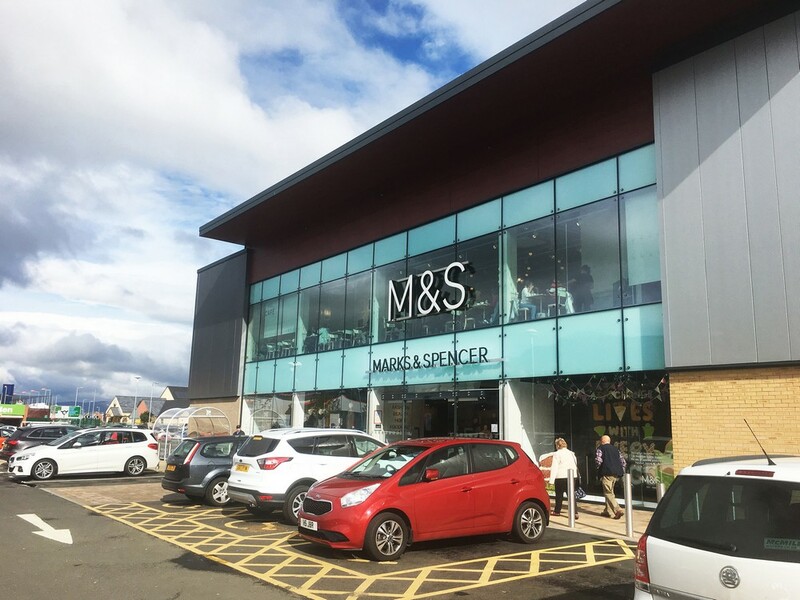 Located on the site of a former supermarket the scheme will incorporate extensive landscaping by Rankin Fraser with wide pavements and dropped kerbs to ease accessibility. 16 Jun – The Royal Incorporation of Architects in Scotland (RIAS) announced 12 winners for its 2017 Awards, representing the very best of current Scottish architecture. 5 Apr – Dualchas Architects have marked their 21st anniversary with a practice re-brand that has seen it adopt the image of a wild Hebridean goat, a symbol of resistance dating back to the Highland clearances, as a new identity, report urban realm. Formed in 1996 the Skye architecture practice has built a reputation for rejuvenating residential architecture throughout the Highlands and Islands by reinterpreting historic styles such as basic turf-topped blackhouses. 5 + 4 Apr – The plans for the 106-acre site on the southern outskirts of Edinburgh – chosen from 28 in Scotland – have received the go-ahead from the Scottish Government. The news should pave the way for a new role for Scotland on the global movie-making stage beyond location filming. 3 Apr – Alexander ‘Greek’ Thomson did more to transform Glasgow into a city fit to be described as the “Second City of the Empire” than any other architect, reports BBC Scotland today. “The booming powerhouse city, which quadrupled in size between 1800 and 1850, needed a new vision as it expanded out from the old slums and Thomson was the man who supplied it. 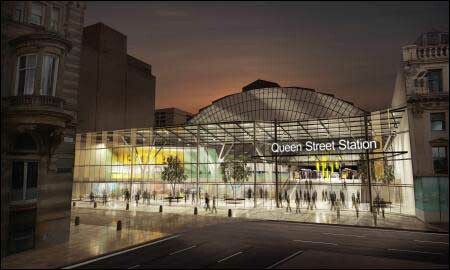 3 Apr – Network Rail have been granted permission to proceed with a major facelift of Queen Street Station to accommodate projected growth in passenger numbers. The scheme by BDP will entail demolition of the present concourse and its replacement by a new expanded platform area extending out to George Square via a 500m glass facade, creating the necessary space for a new fleet of longer Class 385 carriages. 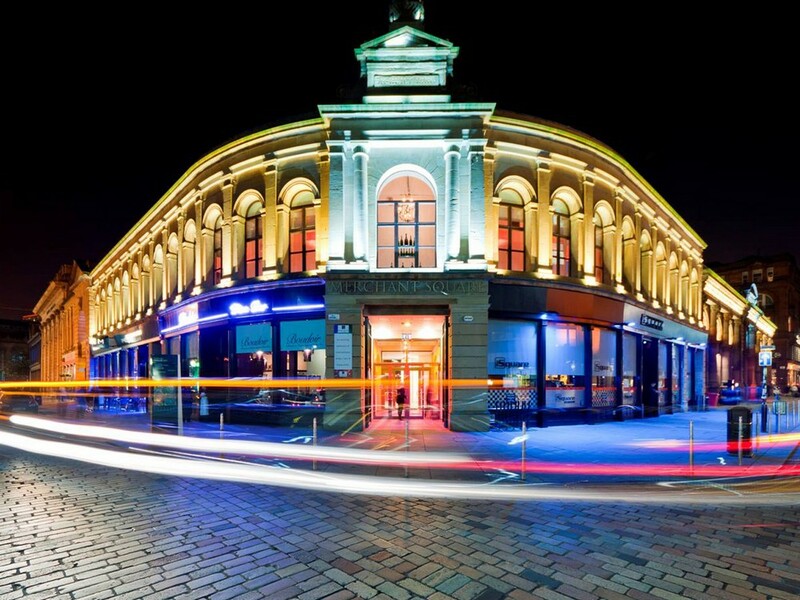 3 Apr – Carrick Properties are to take on a disused former nightclub in Glasgow’s Queen Street for conversion by McGinlay Bell Architects. It will provide speculative office space, while retaining the existing ground floor units. This will allow provision of 3,240sqm of Grade A office accommodation over four upper floors at 21-41 Queen Street. 2 Apr – Shortlisted buildings and architects announced: RIAS Awards 2017 Shortlist.